Small pieces can make big statements, and the hand-painted dot design of this beautiful carved wood figurine is an eye-catching statement for any space. This piece was hand-carved by artists in Indonesia. Place this giraffe art piece in your home office or living room for a unique and eclectic finish. 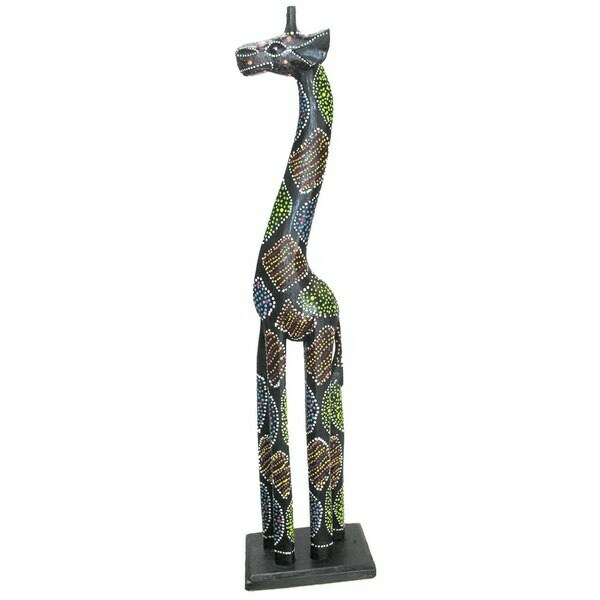 I ordered this along with the Hand-Carved Multi-Colored Giraffe Statue, and they are both exactly as described. As other reviews have mentioned, they are not heavy, solid feeling statues (nor would I think they would be for the price). With a bit of museum glue, though, they are in no danger of falling and breaking despite being located above an open staircase that is also a great cat resting area. These both look beautiful and have enhanced the area where they are on display. This giraffe sits really well and above several plants we have on living room floor. Iinitially, I was concerned that the giraffe would lose some of its colorful dots, but after six months, it has not lost one and looks as great as when it arrived! This giraffe statue is beautiful and very special. You can't improve on perfection! I love everything "Giraffe" and this is super cute and will made. Good purchase or the price. The Giraffe is so pretty !! I ha\ave a collection and this giraffe is not nearly as nice as the others I have purchased.